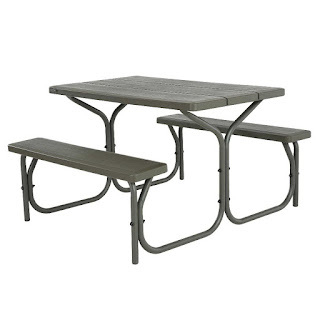 Today only, while supplies last, get this Lifetime 4-Foot Picnic Table for ONLY $99.99 (Retail $199.99)! The 48"x 28" high-density polyethylene tabletop is stain resistant and easy to clean. This model comes in brown with a bronze 31.7mm frame and includes an umbrella hole and cap. Single box packaging. Includes 2-year limited warranty.